[April 21, 2014] Bill Hammond receives the 2013 Editor's Choice Citation for Excellence in Refereeing for his service to the Journal of Geophysical Research-Solid Earth. Congrats, Bill! See page 5 of the Eos article. [March, 9 2014] The Ferndale, California offshore earthquake permanently displaced the coast by as much as ~15 mm to the east. Though the event occurred nearly 80 km west of the coast, rapidly processed GPS solutions with 5 minutes sample interval show significant displacement at EarthScope Plate Boundary Observatory stations P159, P160, P161, P162. The plots below show changes in position of the GPS stations from this strike slip event. More information at the NGL station pages for: P159, P160, P161, P162. More information about this earthquake is available from the USGS. Original data are available from: UNAVCO, Inc.. GPS data processing at NGL is supported NASA and the NSF. See our Acknowledgements page. [December, 2013] We have developed a new North America plate fixed terrestrial reference frame for geodetic studies of crustal deformation. The paper, published by Geoff Blewitt in the Journal of Geodynamics, can be obtained at here, or downloaded from our ftp server . [September 23, 2013] Geoff Blewitt gives seminar on space geodetic constraints on US west coast vertical land motion and sea level rise. Click here to download the presentation (in .pdf format). [May 5, 2013] Corné Kreemer nominated as EarthScope Series Speaker. EarthScope speakers are selected based on their outstanding research accomplishments involving the NSF EarthScope facility as well as their abilities to engage a variety of audiences. Corné Kreemer will join the ranks of this prestigious group for the 2013-2014 series. More information on the EarthScope Speaker Series. [October 16, 2012] Geoffrey Blewitt elected AGU Geodesy Section President. As President of the Geodesy Section, Professor Blewitt will serve a two year term as President Elect starting January 1, 2013, then 2 years as President. The American Geophysical Union has over 61,000 members from over 146 countries. 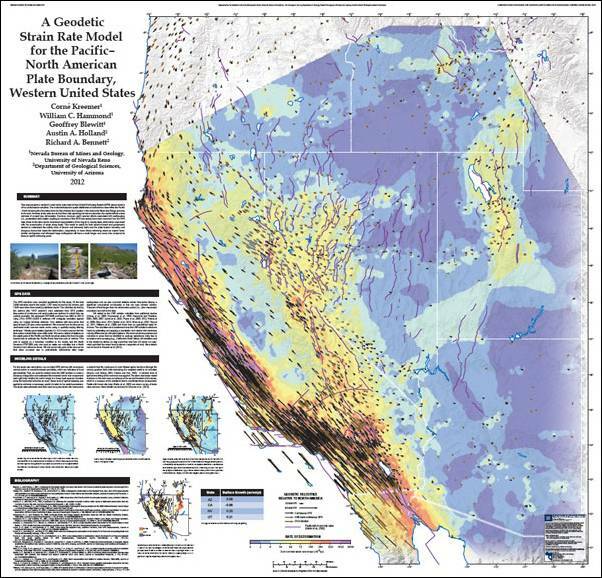 [July 20, 2012] NGL publishes map of geodetic strain rates in western U.S.
We just published an official NBMG map showing GPS velocities and an associated strain rate model for the Pacific-North American plate boundary, western U.S.
A free full-size PDF can be found here. It is 40Mb!! The Sierra Nevada range in California and Nevada is actively uplifing at a rate of 1 to 2 mm/yr. Geodetic measurments based on over 10 years of GPS and InSAR data show that mountain growth can be observed directly, and help show that the Sierra Nevada topography is relatively young in geologic terms. The results are due to be published in the July, 2012 issue of Geology. and read the UNR press release. Also see stories at San Francisco Chronicle, OurAmazingPlanet.com, and Yahoo. Read the UNR press release and the NASA story. NBMG faculty and classified staff have prepared a document in response to the University of Nevada, Reno curricular review proposal. This document is available in .pdf format on the NBMG website, http://www.nbmg.unr.edu or directly at http://www.nbmg.unr.edu/_docs/Response_to_curricular_review_of_NBMG.pdf. In addition to the response document, testimony from NBMG Director and State Geologist, Jon Price, was presented on April 1, 2011 before the Senate Finance and Assembly Ways and Means Joint Subcommittee on K-12 Education/Higher Education. This testimony is also available on the NBMG website or directly at http://www.nbmg.unr.edu/_docs/TESTIMONYbyJonPrice31March2011.pdf. As a reaction to the proposed disproportional cut of more than 50% of the state-funded budget of NBMG, more than 110 letters of support for NBMG were sent to the UNR President from national and international agencies, universities, and individuals. Read selected quotes ...; Read more quotes ...; see overview of all letters. As a consequence of the dire economic situation in Nevada, the Nevada System of Higher Education faces a cut of the state-funded budget of more than 30%. 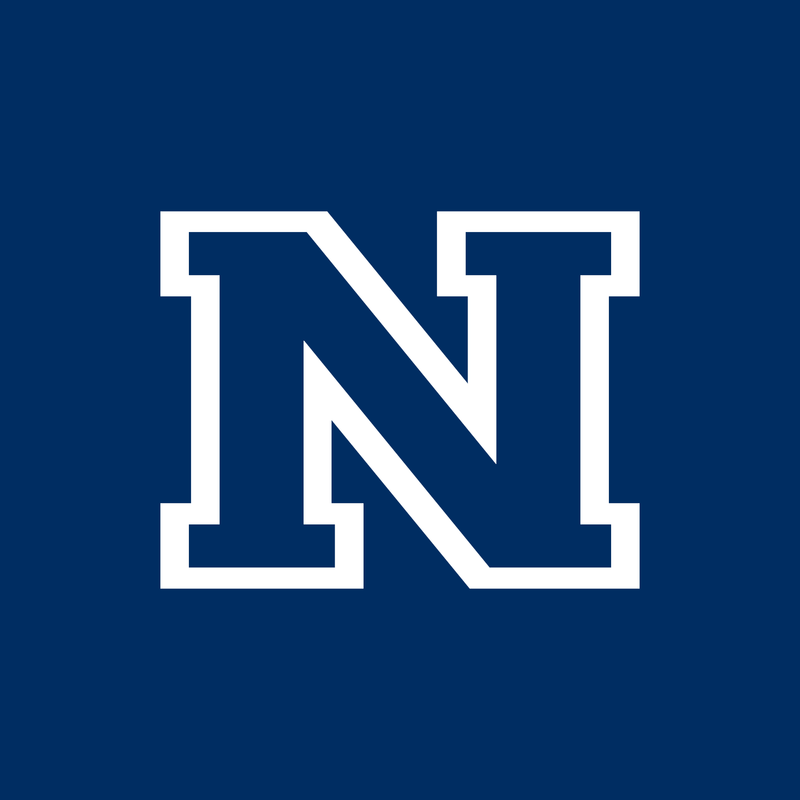 In order to meet the budget cut requested by the Nevada legislator, the President of UNR has proposed to cut the budget of NBMG disproportionally by more than 50%. Such a cut would take away the economic basis for NBMG to provide mandated services for Nevada. The cut would also reduce the ability of NBMG to win external grants and have a significant negative impact on the overall UNR budget and the economy of Nevada. A devastating earthquake struck northeast Japan March 11, 2011 at 05:46:23 UTC. NGL has collaborated with NASA and JPL to develop prototype tsunami warning systems based on GPS. MORE about this event HERE. 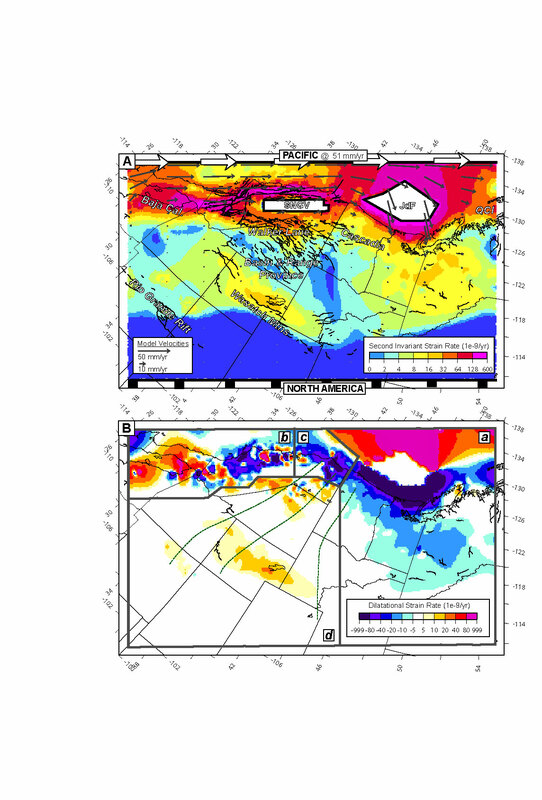 See AGU Fall Meeting Highlights news focus on Hammond et al. 2010 presentation on Sierra Nevada Uplift in Science, v. 331, p. 143, January 14, 2011 . A new study has been published in the Journal of Geophyscial Research: "Block Modeling of Crustal Deformation of the Northern Walker Lane and Basin and Range from GPS Velocities". Here we have used geodetic and geologic data to evaluate fault slip rates in this zone of complex crustal deformation. See Hammond et al., 2011 article in press. Group member Corné Kreemer has won the 2010 Geodesy Section Award from the American Geophysical Union (AGU). The Award is given each year to an AGU member under the age of 40 who shows the potential to become an AGU Fellow in the future. The Award is given in recognition of major advances in geodesy, and Corné was particularly honored for his work on the Global Strain Rate Map. A UNR article about Corné and his award can be found here. Recognizing the growing reliance of a wide range of scientific and societal endeavors on infrastructure for precise geodesy, and recognizing geodetic infrastructure as a shared national resource, this book provides an independent assessment of the benefits provided by geodetic observations and networks, as well as a plan for the future development and support of the infrastructure needed to meet the demand for increasingly greater precision. Precise Geodetic Infrastructure makes a series of focused recommendations for upgrading and improving specific elements of the infrastructure, for enhancing the role of the United States in international geodetic services, for evaluating the requirements for a geodetic workforce for the coming decades, and for providing national coordination and advocacy for the various agencies and organizations that contribute to the geodetic infrastructure. Reference: Minster, J.B., Z. Altamimi, G. Blewitt, W.E. Carter, A. Cazenave, H. Dragert, T.A. Herring, K.M. Larson, J.C. Ries, D.T. Sandwell, J.M. Wahr, and J.L. Davis (2010). Precise Geodetic Infrastructure: National Requirements for a Shared Resource, 142 pp. The National Academies Press, ISBN-10:0-309-15811-7, ISBN-13: 978-0-309-15811-4. 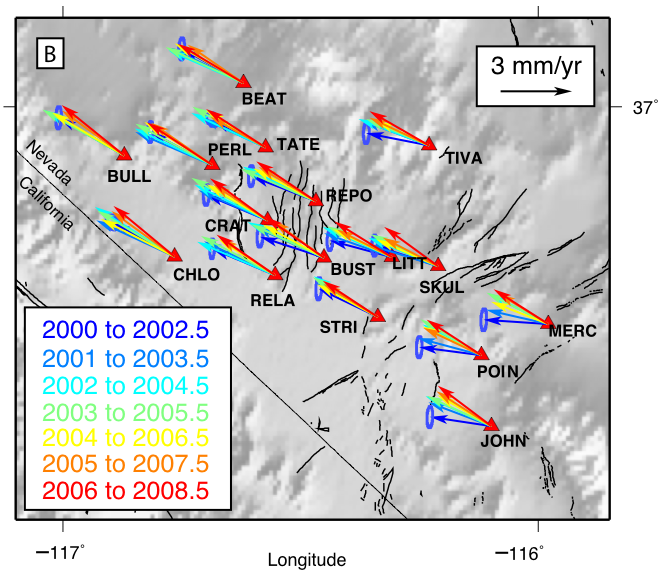 We combined GPS velocities and earthquake focal mechanisms to suggest that there exists an E-W trending sinistral shear zone in southern Nevada (Kreemer et al., 2010). This Pahranagat shear zone accommodates 2 mm/yr near the Nevada-Utah border and less to the west. The shear zone is a transfer zone between rigid crust to the north and diffusily extending crust to its south, and is a natural connection between the Wasatch fault zone and the Eastern California Shear Zone. We analyzed data from continuous GPS sites in the Southwest U.S. and derived the very small motions relative to stable North America (Kreemer et al., 2010). 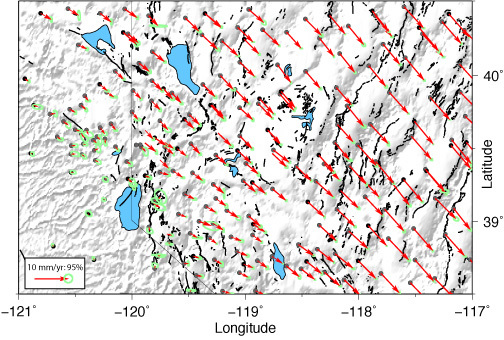 We show that the central part of the Plateau rotates as a rigid entity around a pole in the northern Rockies, but that the western and eastern margins of the plateaus show active extension. Read the blog after our 2010 AGU talk. 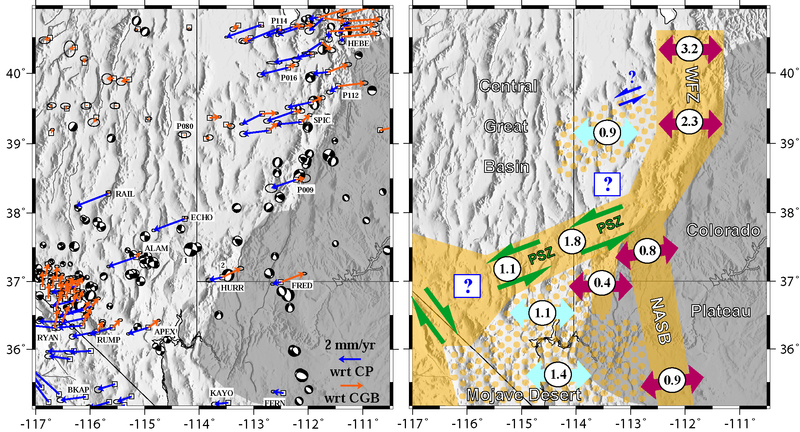 A study of GPS data from sites around Yucca Mountain, Nevada shows how postseismic relaxation from distant earthquakes can affect estimates of long-term strain rates (Hammond et al., 2010). These effects can cause strain GPS rates to change over time, and have important implications for tectonic interpretation and seismic hazard analysis. 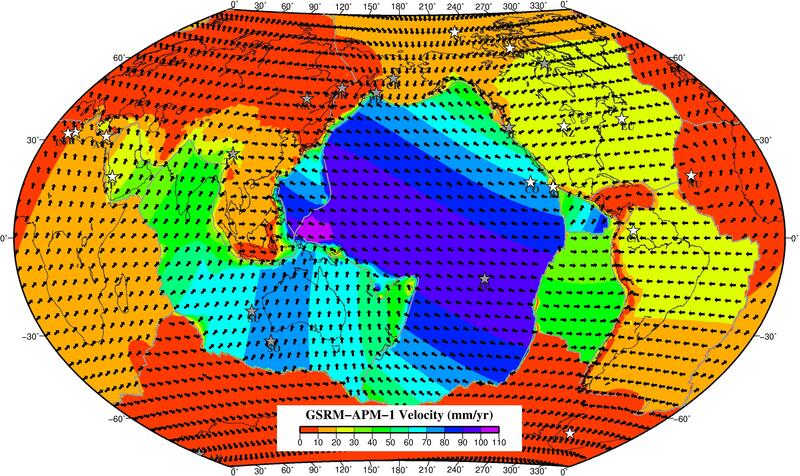 We published a new absolute plate motion model (GSRM-APM-1) that is not derived from hotspot data, but from an alignment of present-day surface motions to mantle anisotropy orientations. You can find more information in Kreemer (2009). The figure below shows the GSRM-APM-1 velocities as well as Euler pole locations. Figure Caption: (click on figure for higher resolution) Vectors indicate velocity directions in the GSRM-APM-1 reference frame and color contours are the velocity amplitudes. Stars are Euler pole locations (white, counterclockwise rotation; grey, clockwise rotation). The book "Global Geodetic Observing System: Meeting the Requirements of a Global Society on a Changing Planet in 2020" has been published by Springer. Hans-Peter Plag was the lead editor of the books and a key contributor. See http://www.springer.com/978-3-642-02686-7 for details, and/or order it at Amazon.com. Please contact the authors (Blewitt , Kreemer ,Hammond) for details, reprints, etc. New Publication: Corné Kreemer and Bill Hammond have used a large compilation of geodetic velocities in the Pacific-North America plate boundary zone to show that between the Gulf of California and the Queen Charlotte Islands the plate boundary undergoes no net areal change, consistent with being a transform plate boundary. They also showed that the area growth in the great Basin and Range is all offset by areal reduction in northern California above the southern Cascada subduction zone. This kinematic link is corroborated by independent geodynamic indicators and enforces the idea that the southern Cascade subduction zone may act as a 'window escape' for the Basin and Range material to flow/collapse towards. These results are now published in the journal Geology. The same journal issue also contains a comprehensive perspective of these results. Reprints are available upon request. A: Pacific-NorthAmerica (PA-NA) plate boundary zone in western North America in an oblique Mercator projection around the PA-NA pole of rotation. North American model boundary is fixed, while the Pacific boundary is constrained to move at the full PA-NA rate. The Sierra Nevada - Great Valley microplate (SNGV) and Juan de Fuca plate (JdF) are modeled as rigid entities within the deforming grid. Black lines are Quaternary faults. Colors indicate second invariant of strain rate tensor field. Grey arrows are interpolated model velocities relative to North America. QCI, Queen Charlotte Islands. B: Contours of the dilatational strain rates. Red and blue colors indicate extension (i.e., area growth) and contraction (i.e., area reduction), respectively. The gray lines divide the plate boundary into four zones (results for specific zones are published in article). Dashed green lines are trajectories along (averaged) minimum principal stress observations for the greater Basin and Range Provice (Humphreys and Coblentz, 2007). A team of researchers from NGL and Northwestern University has shown that highly precise GPS measurements may more quickly assess the danger of a tsunami by rapidly estimating the magnitude of large tsunamigetic earthquakes in near real-time. The results have been published as a cover story in Geophysical Research Letters. Click here for a PDF reprint. Click image for high-resolution figure. Figure Caption: (above) Time series (blue lines) of east component of ground displacements after the great December 2004 Sumatra earthquake, recorded by continuous GPS sites in Southeast Asia. The earthquake produced changes in site positions that are large enough to allow the magnitude of the earthquake to be assessed within 15 minutes, faster than was possible with seismic data alone. This time interval is shorter than the time required by the tsunami to cross the Indian Ocean, illustrating that GPS data can contribute to tsunami warning by assessing whether an earthquake is large enough to generate an oceanwide tsunami. The tsunami arrival times (color contours on map) are made available by NOAA Center for Tsunami Research (director: Dr. Frank Gonzalez). The M=9.2 earthquake of 26 December 2004, near northern Sumatra, was the largest earthquake ever directly recorded with modern-day space geodesy. 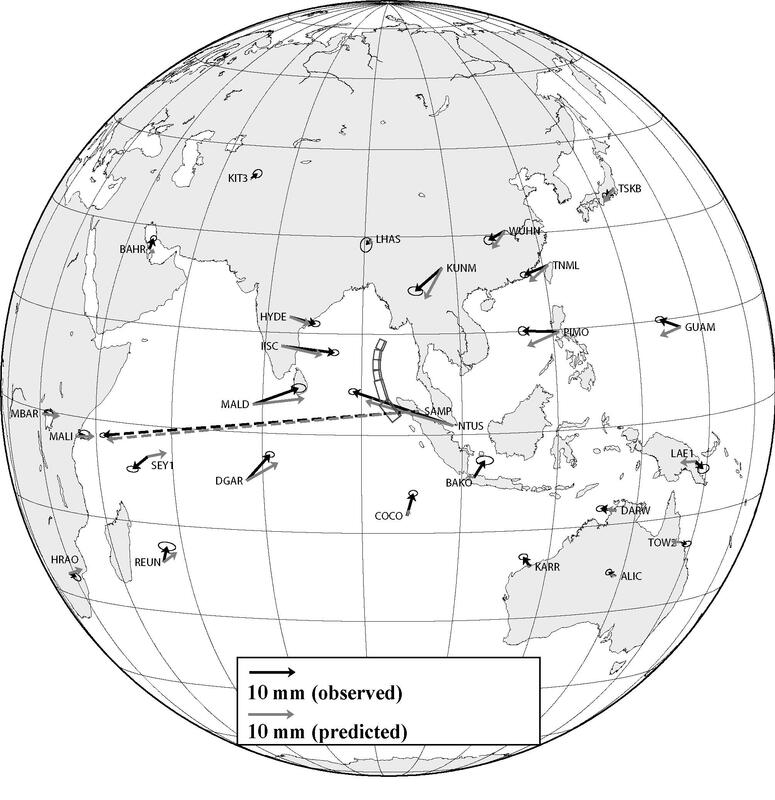 This earthquake and its subsequent tsunami caused immense loss of lifes and property around the Indian Ocean. Researchers of the Nevada Geodetic Laboratory have contributed to the understanding of this earthquake. They have also started to study the feasibility of using GPS in estimating the earthquake's magnitude and tsunami potential in real-time. These developments could be crucial for enhancing existing and futuretsunami warning systems. To your left you see a map of the eastern hemisphere. It shows in black arrows the horizontal displacements of GPS positions during the earthquake. You can see, for instance, that at many thousands kilometers away from the epicenter the Earth's surface moved with several millimeters. 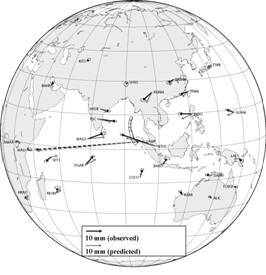 For instance, points in India moved approximately 1 cm to the east during the earthquake. These displacements are measurable by averaging GPS positions for the days before and after the earthquake. The offset estimates can be used to quantify the earthquake's magnitude and the rough characteristics of the slip pattern during the event. Our results, which have just been published, agree with those obtained by other research groups. The challenge we now face is two-fold. 1) Can we obtain reasonably accurate offset estimates using only minutes (instead of days/weeks) of data before and after the arrival of seismic waves at the GPS locations? 2) If GPS locations many thousand kilometers away from the epicenter moved, how can a stable global geodetic reference frame be maintained? Last edited 02 January 2018.